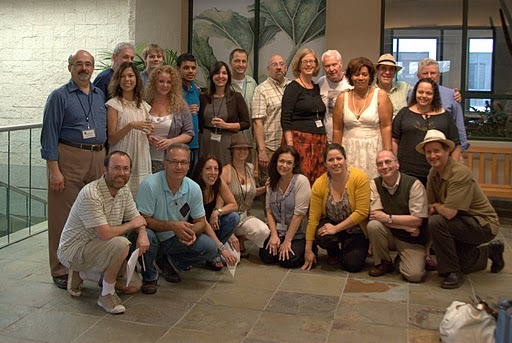 The Los Angeles Shakespeare Institute Is a unique, two-week institute for English and Drama teachers, presented by The Shakespeare Center of Los Angeles and the UCLA William Andrews Clark Memorial Library. The Institute focuses on teaching Shakespeare through performance. The course features an international faculty of scholars, educators and theatre professionals;and takes advantage of one of the world's great libraries and research centers, its contemplative gardens, and its proximity to the entertainment capital of the world. Topics covered Include scene study, verse and text work, voice, movement, classroom pedagogy, and theatre history and criticism. Attendance at selected plays and museums is required during the two week course. Outside reading and a final evaluation are also required. The international faculty is led by writer and director Louis Fantasia, formerly Director of the International Shakespeare Globe Centre's Teaching Shakespeare Through Performance Institute and former President of Deep Springs College. Louis is the author of Instant Shakespeare, published by Ivan R. Dee in the U.S and A&C Black in England, and Talking Shakespeare, published by Peter Lang Publishers. .The staff includes master teachers and theatre practitioners, as well as guest speakers and visiting scholars. Chris Anthony, Director, Will Power for Youth, Managing Director, California Repertory Theatre, CSULB; MFA in theatre from California Institute of the Arts, over 20 years of community-based work in schools, community, and professional settings. Charles Duff, international theatre and opera director, teacher and author, has been involved with the rebuilt Shakespeare's Globe and Globe Education from its inception. He is the author of The Lost Summer (Nick Herne UK and Heinemann USA), which chronicles the heyday of the British theatre between the two world wars. Frances Marsden is a member of the faculty and Board of Directors of the Alexander Training Institute of Los Angeles, Inc. She is past Chair of the Training Approval Committee of the American Society for the Alexander Technique. She also maintains studios in North Hollywood and Pasadena. Yolanda Sanders BA in Communications, Howard University; MFA in Acting, UCLA. Some of her work includes the national one-person show, "Faces of America," Voice of America's popular radio drama "Pay Day," as well as other numerous radio dramas, documentaries, and PSA's. Skip Nicholson has taught English for 20 years at South Pasadena High School where he was Head of English. He has worked as a master teacher in Folger Shakespeare Library/NEH summer institutes, and for conferences of the Shakespeare Globe Center and the English Speaking Union. Dr. Louis Scheeder is the Associate Dean of Faculty and Interdisciplinary Studies, Tisch School of the Arts, and Associate Arts Professor at the Tisch School of the Arts, New York University. He is the co-author (with Shane Ann Younts) of All the Words on Stage: A Complete Pronunciation Dictionary for the Plays of William Shakespeare (Smith & Kraus). Dr. Susan Gayle Todd, teaches at St. Edward's University. She is the founding director of The Weird Sisters Women's Theater Collective in Austin, Texas where she also directs and teaches Shakespeare at the Scottish Rite Theatre. Classes during the two-week workshop include scene analysis, acting and directing techniques, curriculum development, research techniques, and lectures by distinguished scholars and theatre professionals. The course includes visits to Los Angeles area museums and attendance at theatres. While the modules that constitute the course are the same each summer, the content within each module varies every summer. Tuition for the two week program (9:30 a.m. - 4:30 p.m. M-F) is $250.00 ($100 non-refundable). Interested teachers should submit an application by May 20, 2019. Applicants will be notified by June 1, 2019. Payment of fees must be received by July 1, 2019 .